FOR ALL YOUR KITTEH NEEDS! HA HA!!! I woke up around 8:30 this morning, and my mom was still sleeping so I thought, "What the heck, I'll feed em." So I fed the kittehs breakfast and went back to wake my mom up. I told her I fed the kittehs, and she's like, "Oh, no! They already ate!" She was still tired, so to me it sounded like she said it with a question mark at the end. I said, "What? It's already 8:30!" We usually feed them at 7:00. My mom then said, "No, no, they already ate at 7:00! I got up, fed them, and went back to bed." It was crazy. No wonder Mikey gave me his rare "smile" and Izzy didn't come very quickly. Welcome to The Kitteh Newz! This is The Kitteh Newz, all the newz about my 1-year old cat siblings, Mikey (male) and Izzy (female). Come on in! Explore their world! What color are your cat's eyes? Please send me YOUR newz, or anything else! ║╚╣║║╚╗If you love to laugh! No, Mikey, you're not gonna like that! 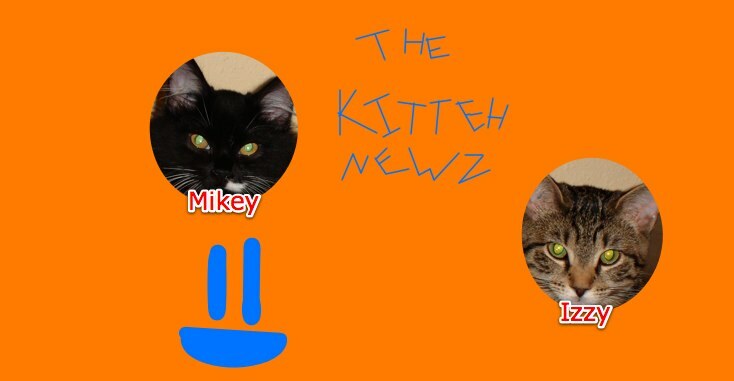 Thank you for visiting Kitteh Newz! Mikey and Izzy ROCK MY WORLD!